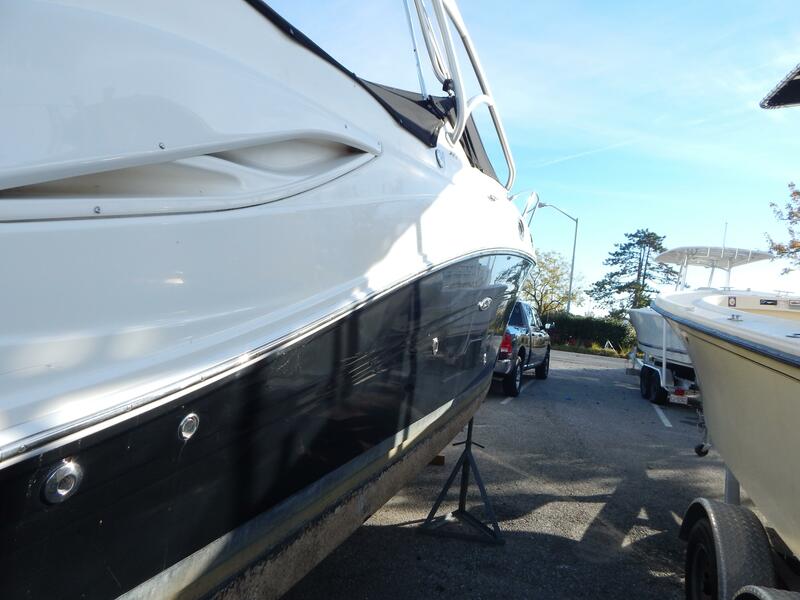 VERY CLEAN AND JUST DETAILED! 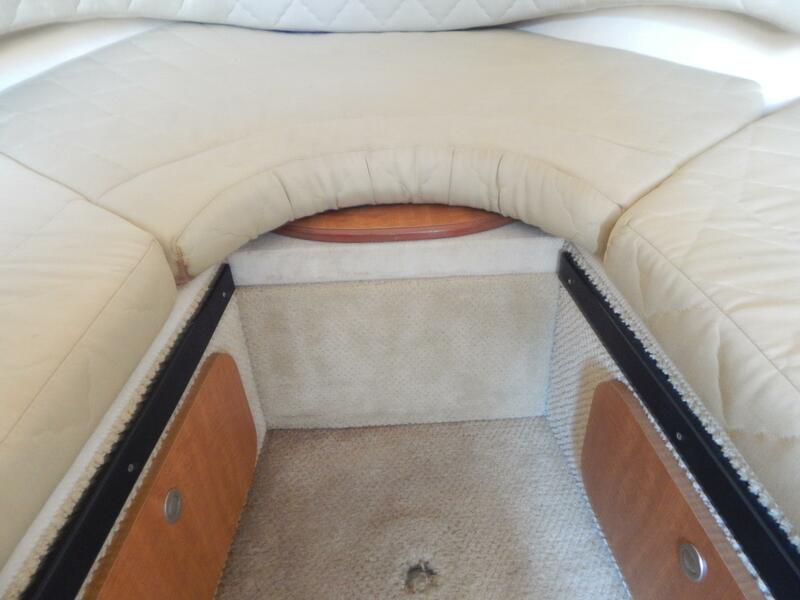 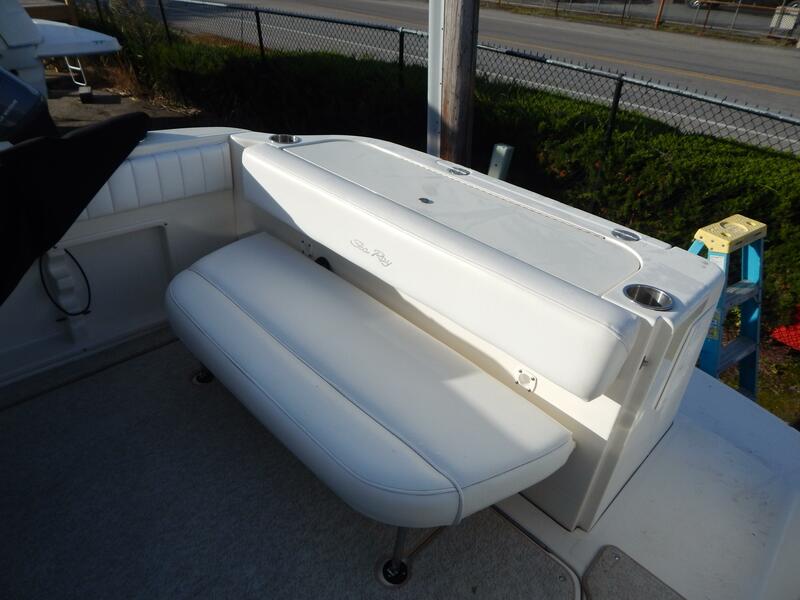 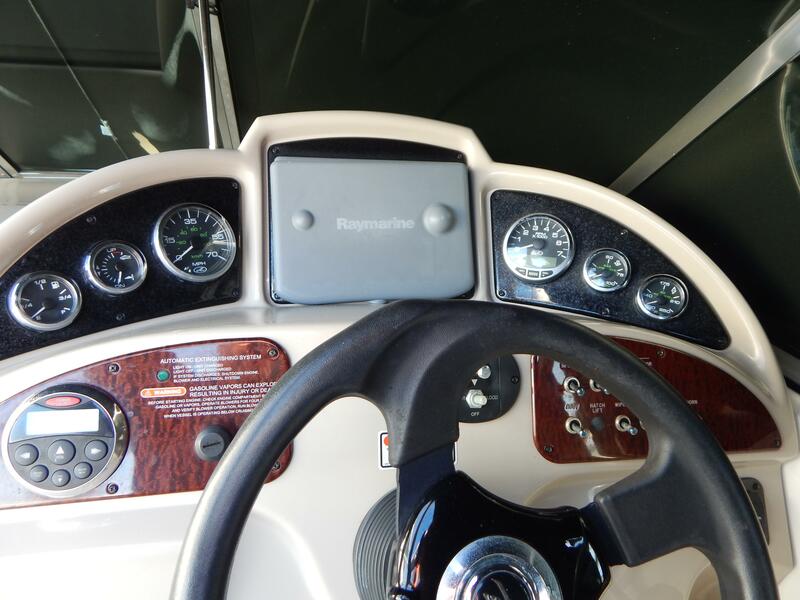 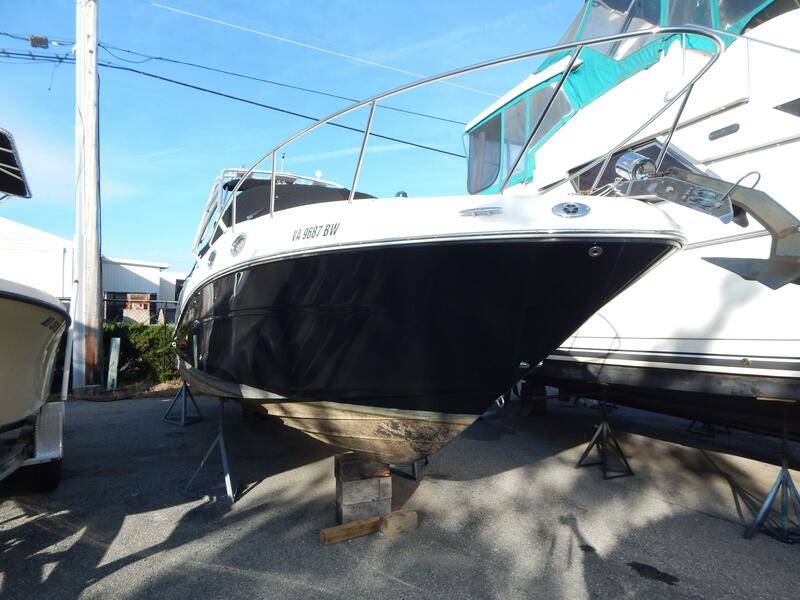 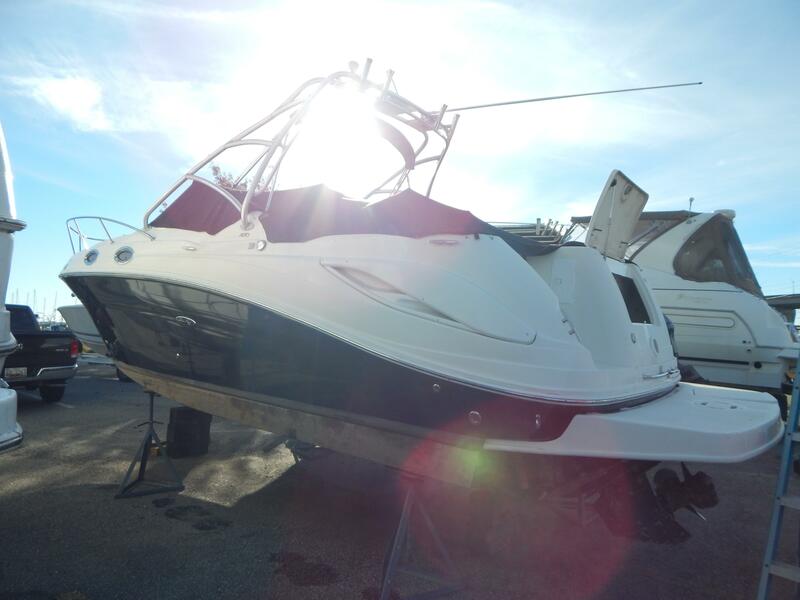 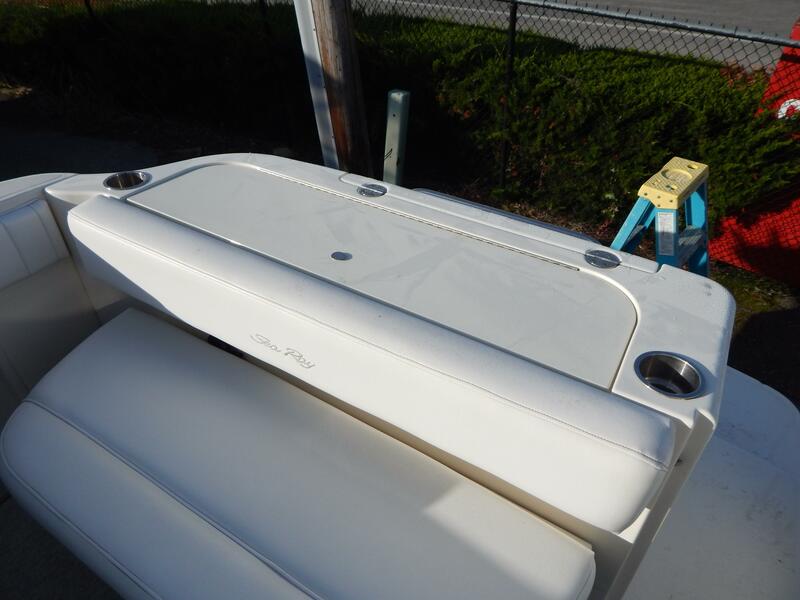 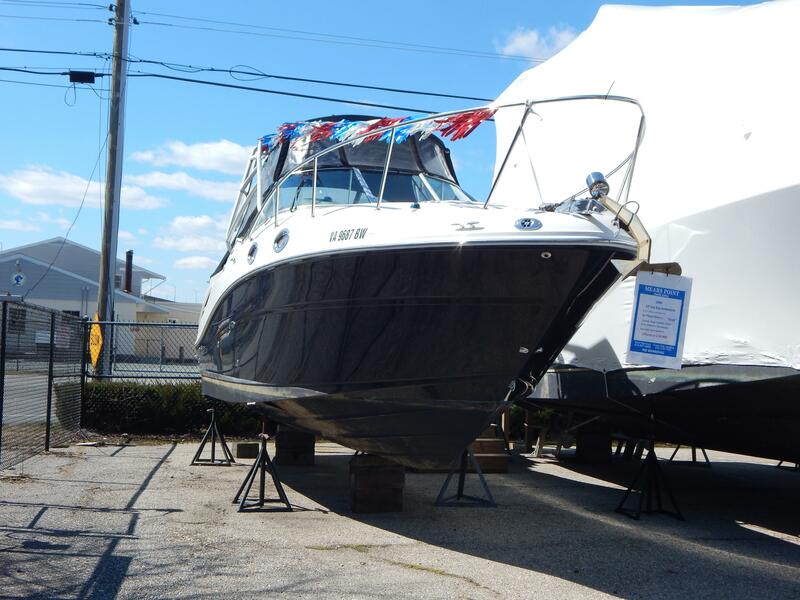 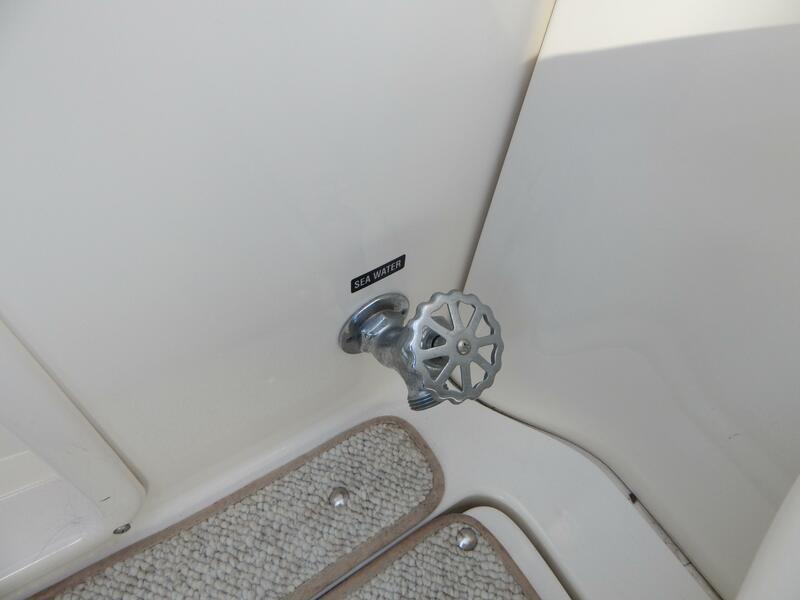 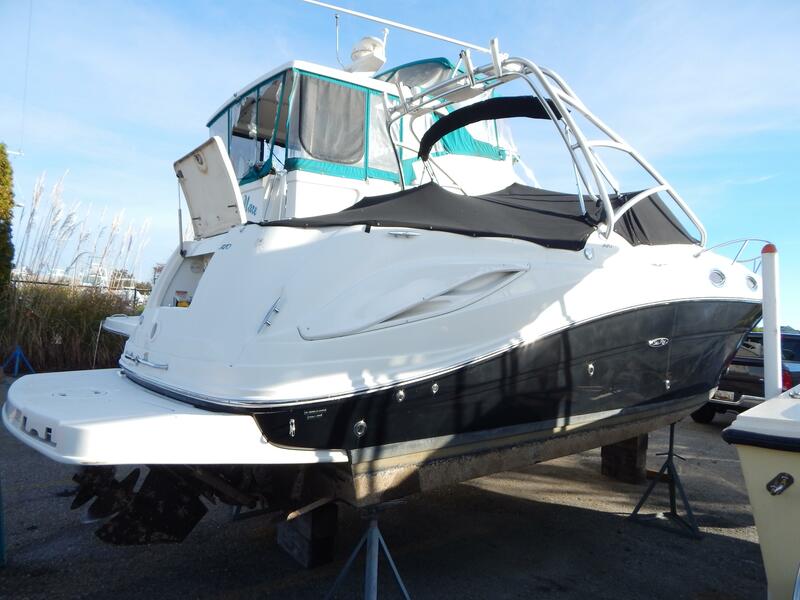 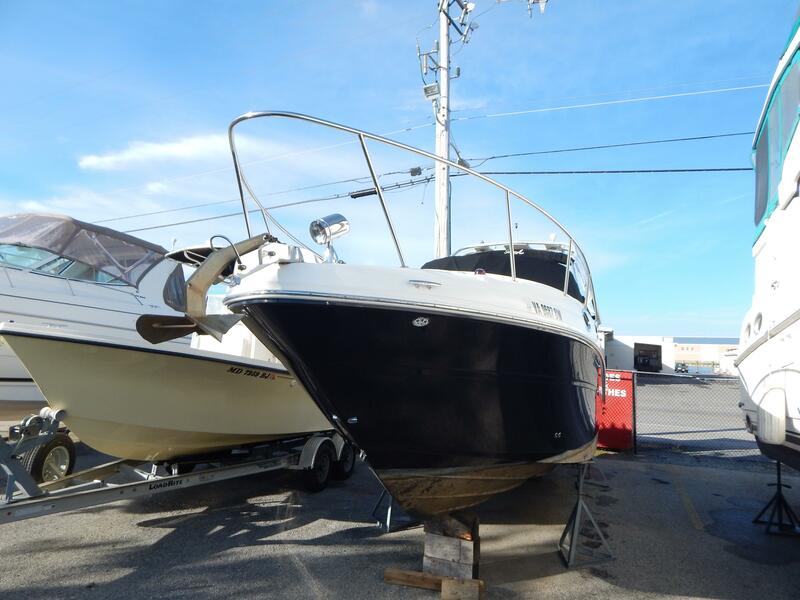 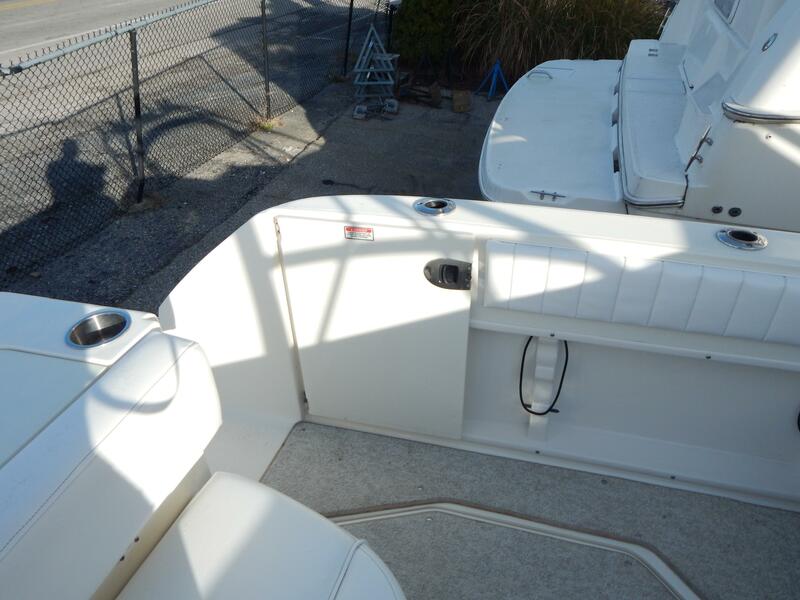 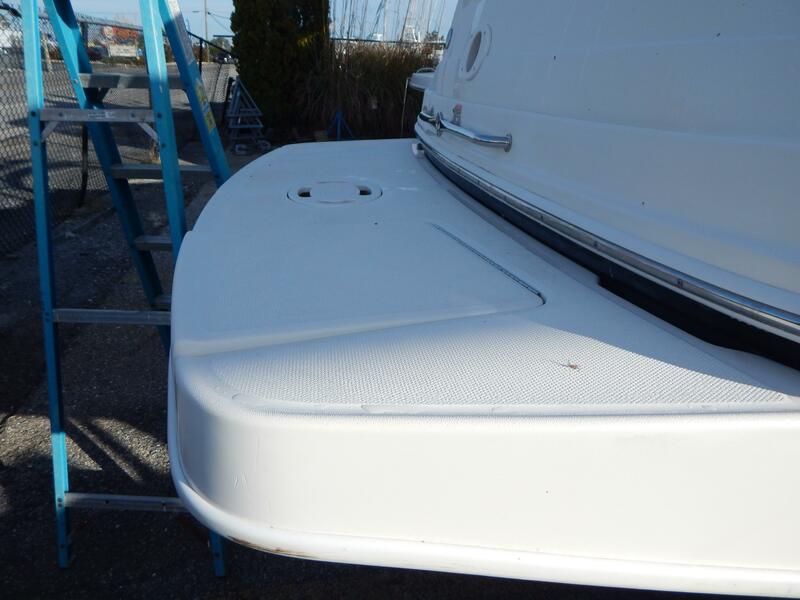 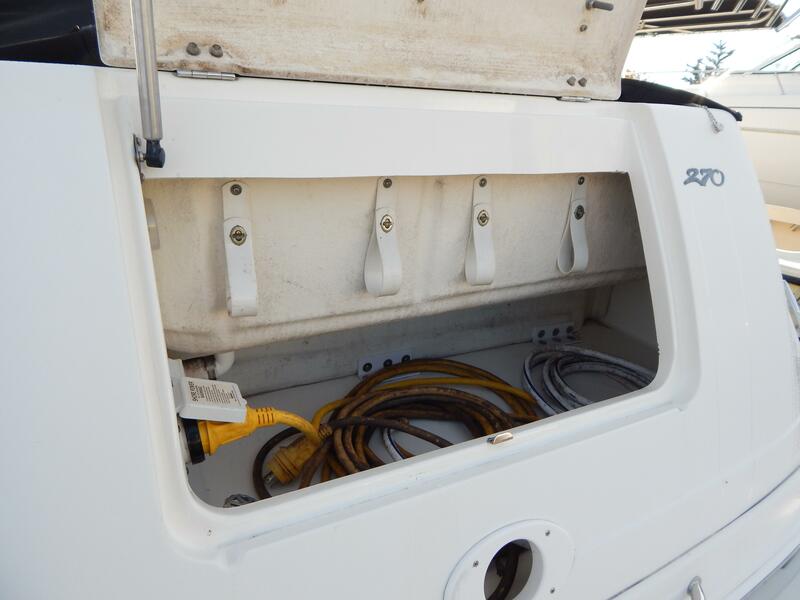 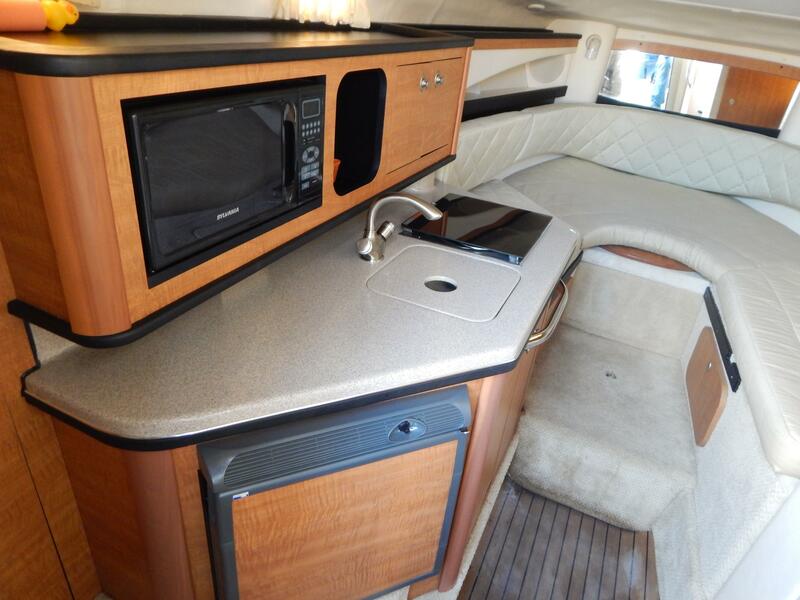 HERE IS A GREAT EXAMPLE OF THE 270 SEA RAY AMBERJACK. 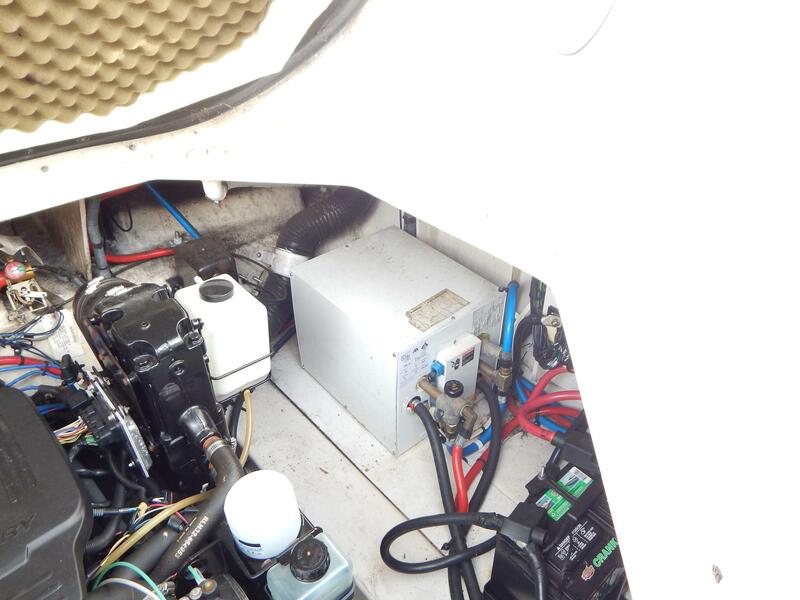 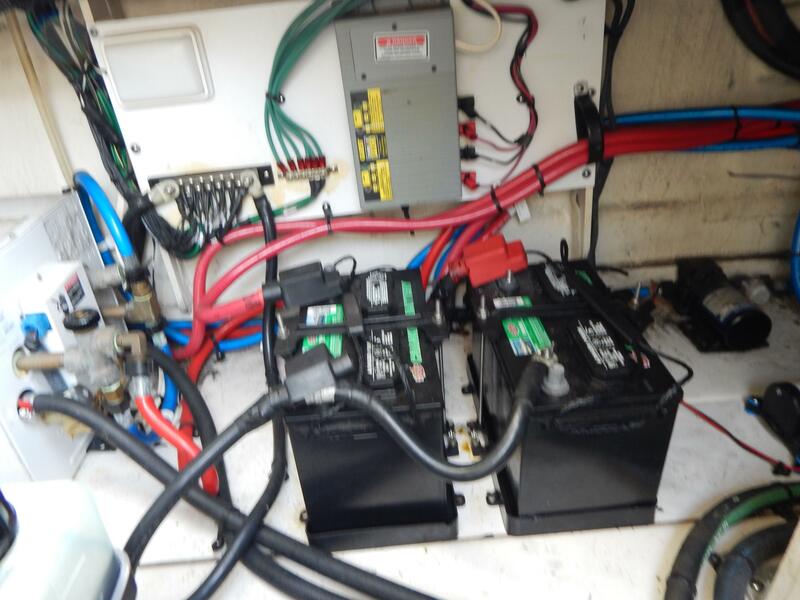 SHE IS POWERED BY A 6.2lt MERCRUISER w/a BRAVO III OUTDRIVE. 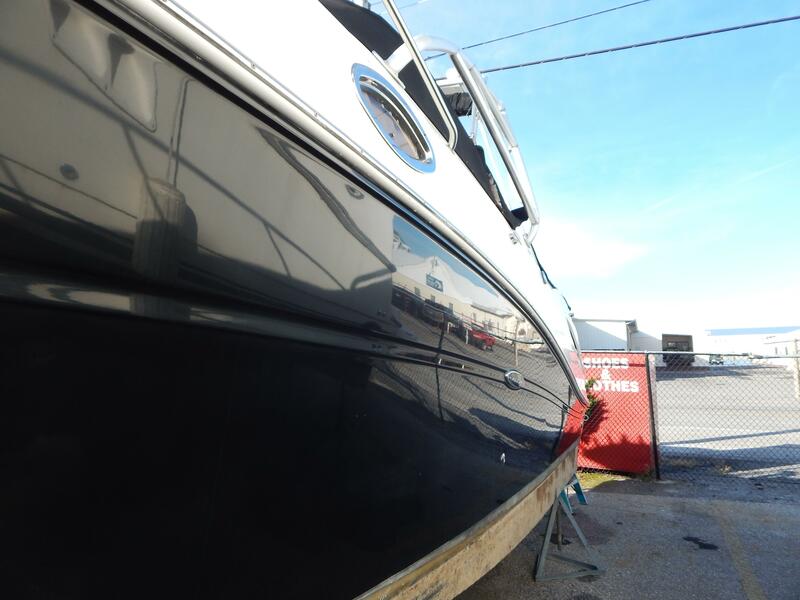 HER BLACK HULL SHINES BEAUTIFULLY AND HER GELCOAT SHOWS GREAT. 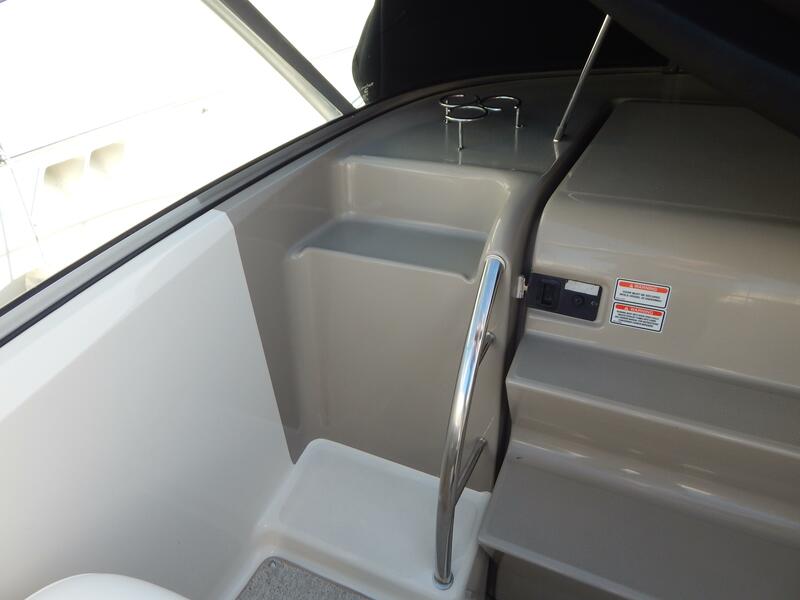 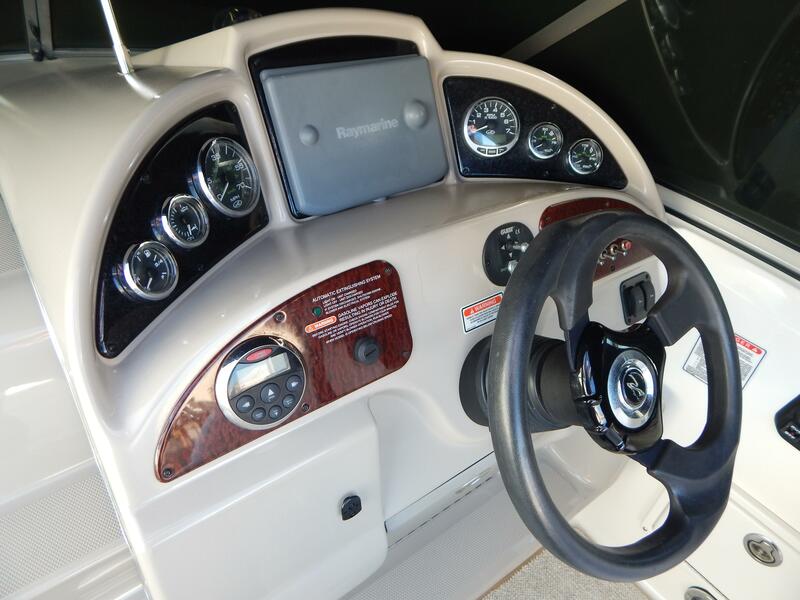 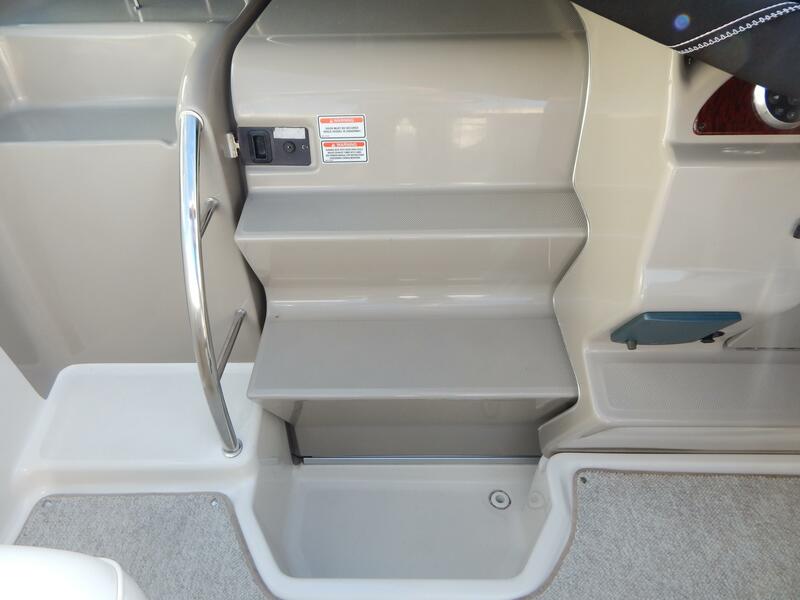 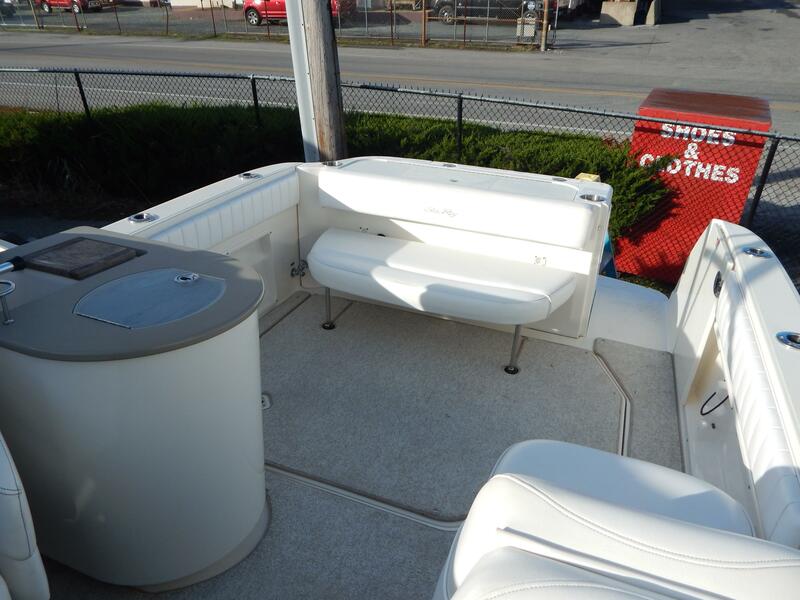 AS YOU ENTER THE COCKPIT FROM THE GOOD SIZED SWIM PLATFORM w/TRANSOM STORAGE, YOU SEE THAT SHE OFFERS PLENTY OF SPACE FOR FISHING OR ENTERTAINING, WITH A DOUBLE TRANSOM BENCH SEAT THAT FOLDS OUT OF THE WAY. 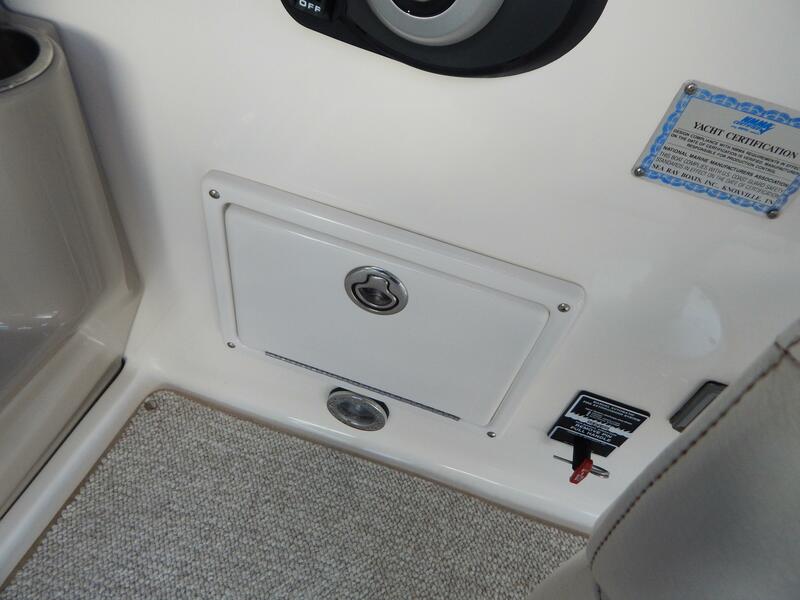 A LARGE HATCH OFFERS GREAT ENGINE ACCESS. 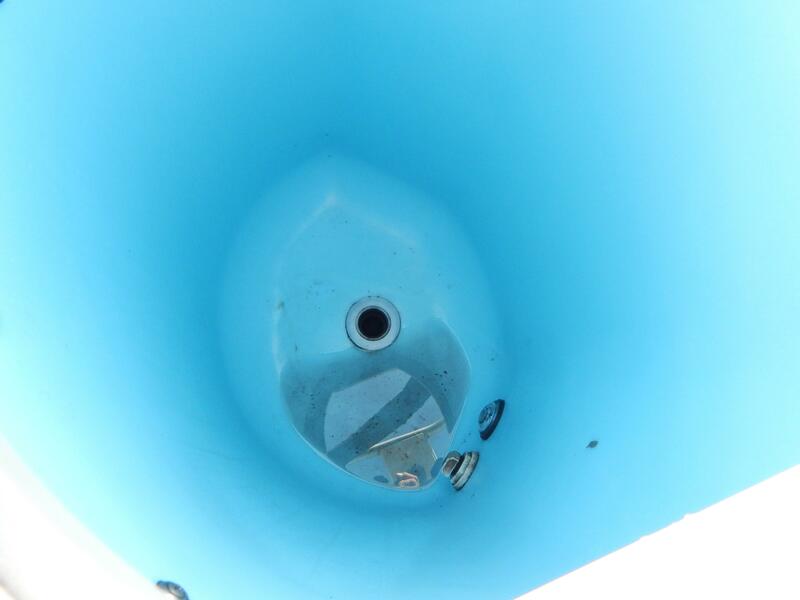 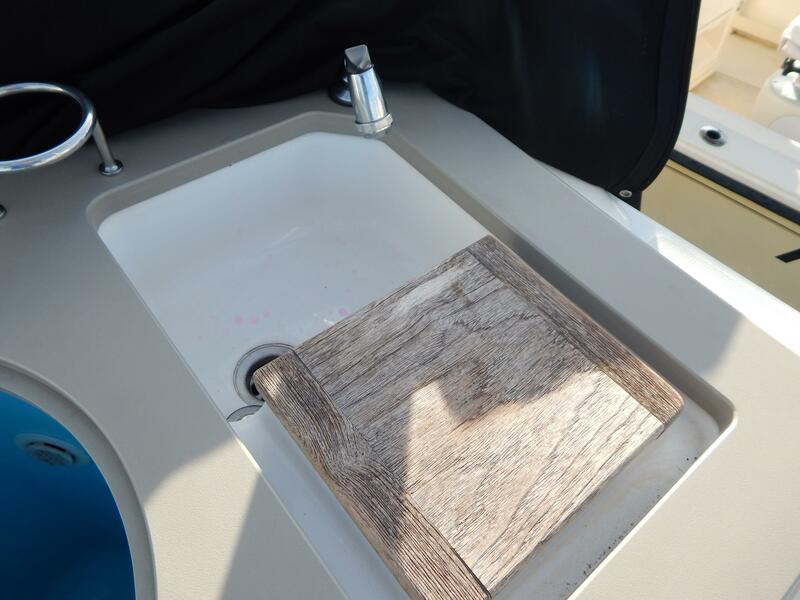 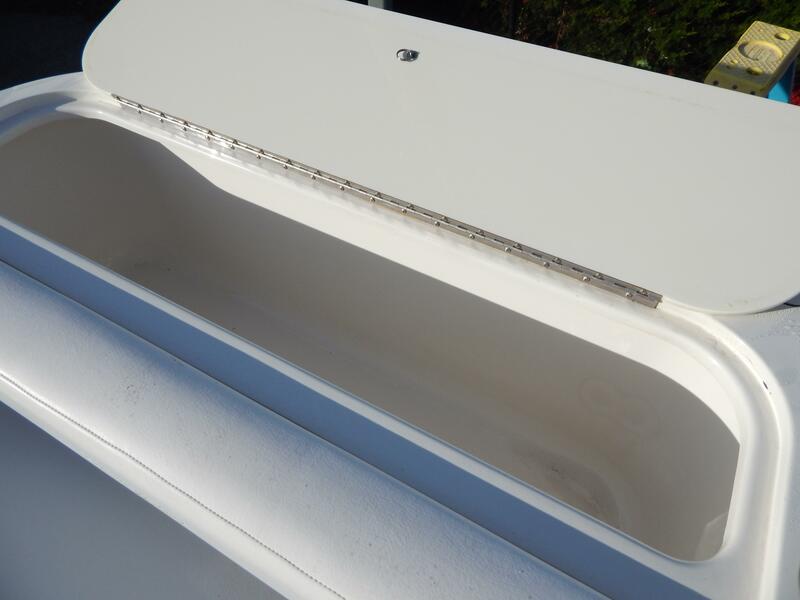 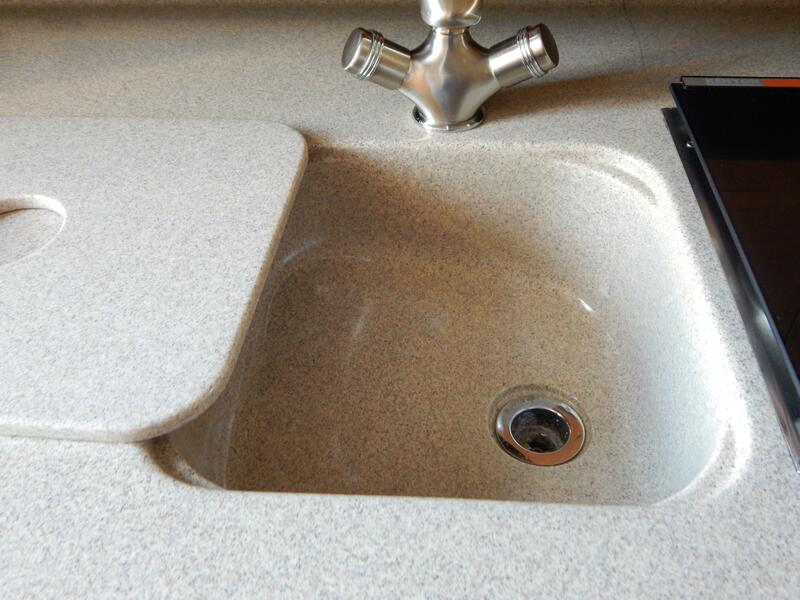 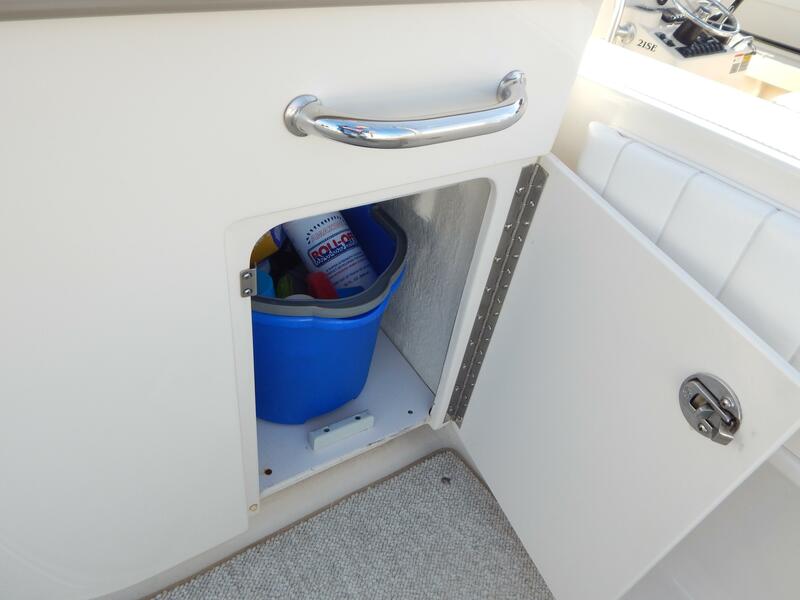 SHE HAS A NICE BAIT PREP AREA WITH SINK THAT WILL EASILY DOUBLE AS A MINI WET BAR! 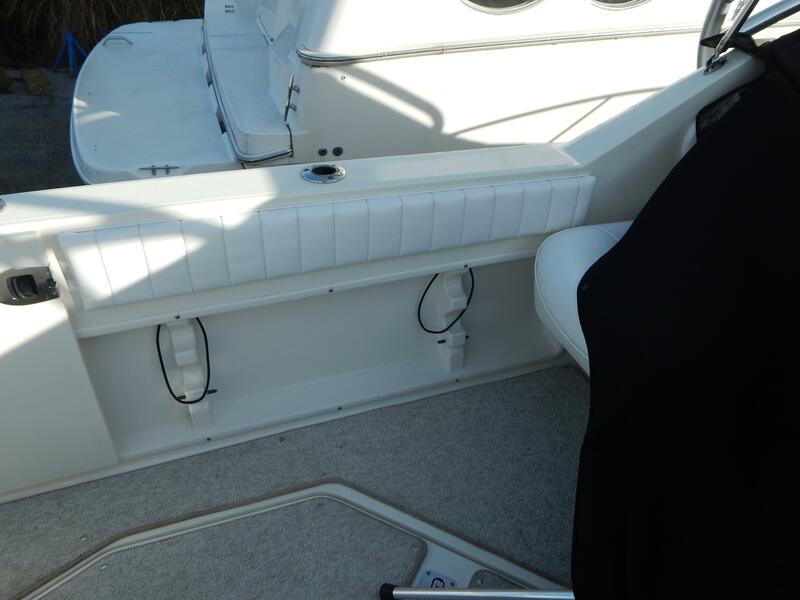 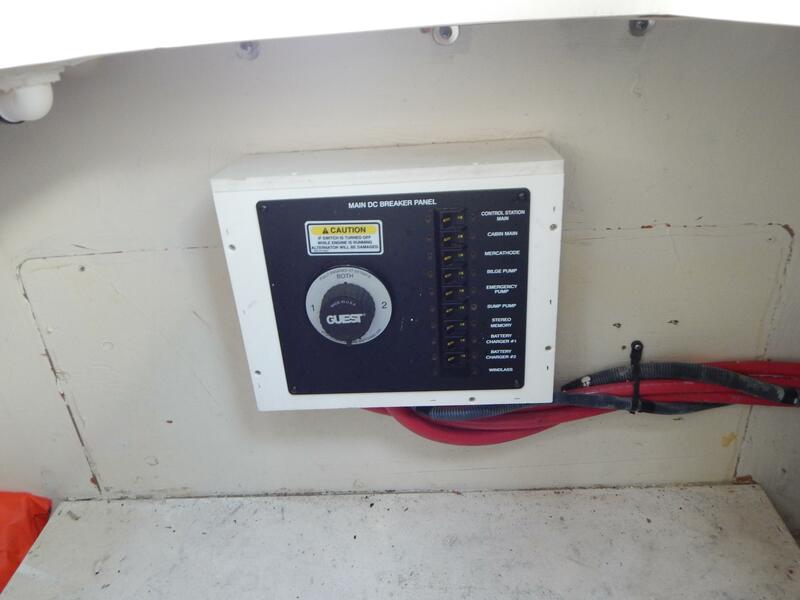 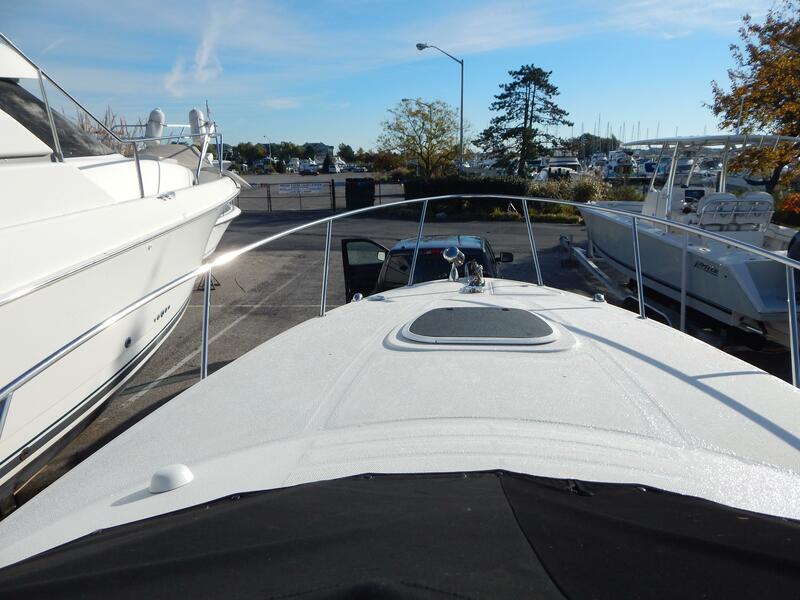 THE HELM IS WELL LAID OUT WITH A RAYMARINE C-70 GPS/CHART PLOTTER FRONT AND CENTER AND FULL INSTRUMENTATION. 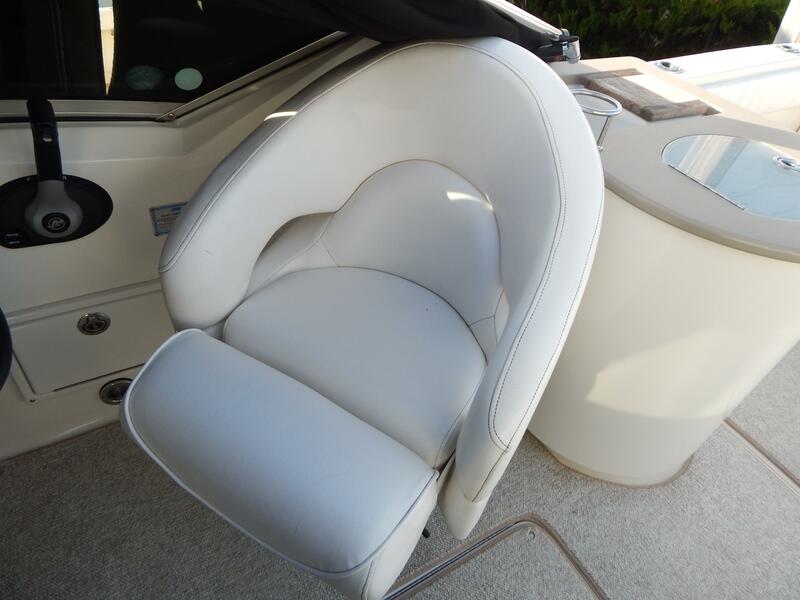 HER SINGLE HELM SEAT OFFERS A COMFORTABLE RIDE FOR THOSE LONG CRUISES AND SWIVELS TO FACE HER COMPANION SEAT/LOUNGE. 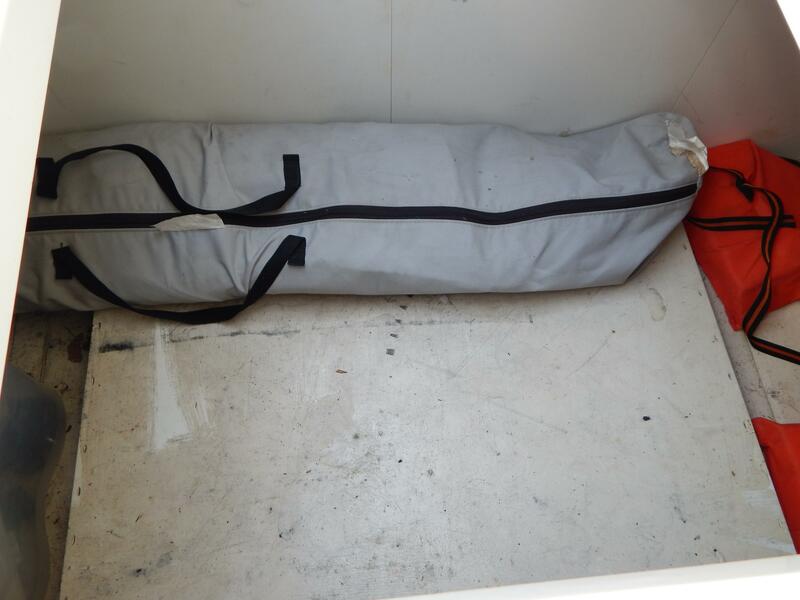 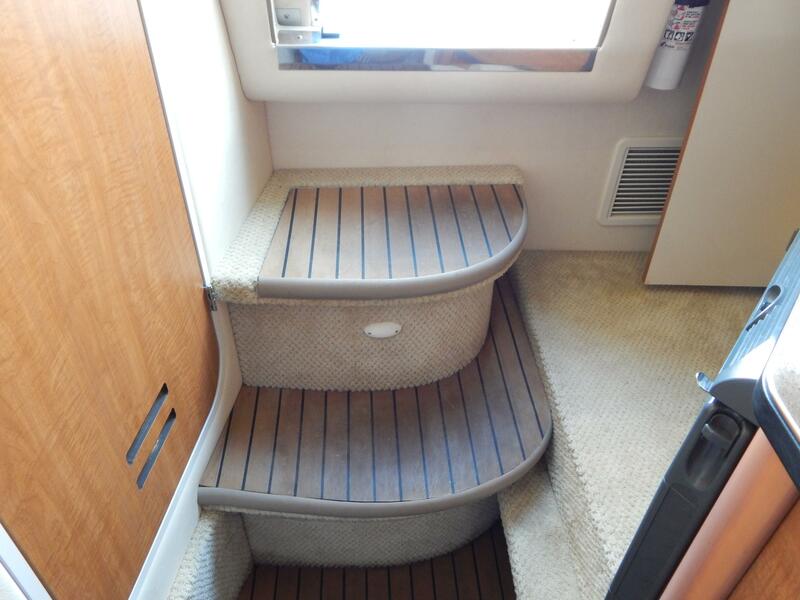 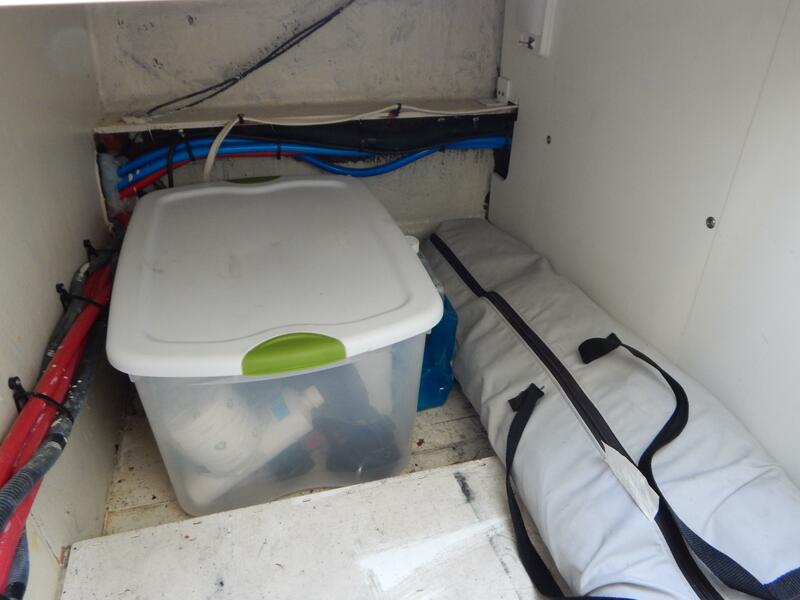 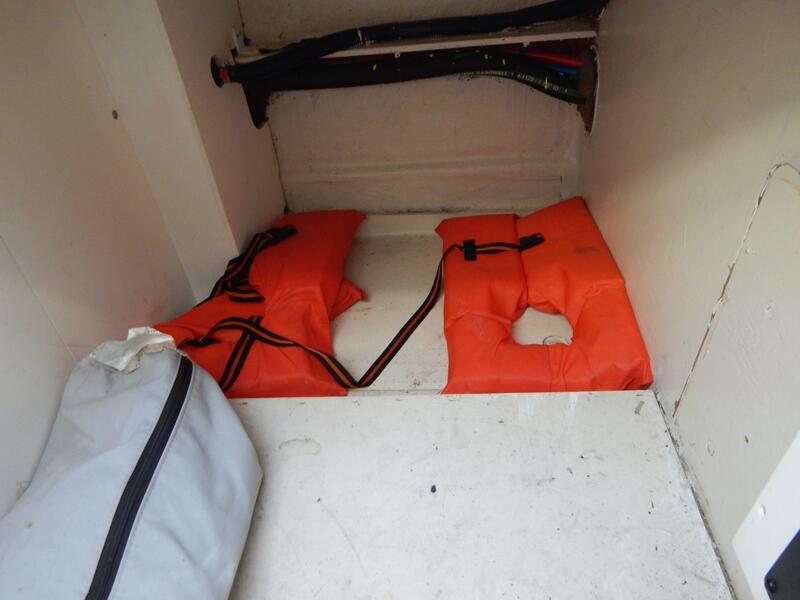 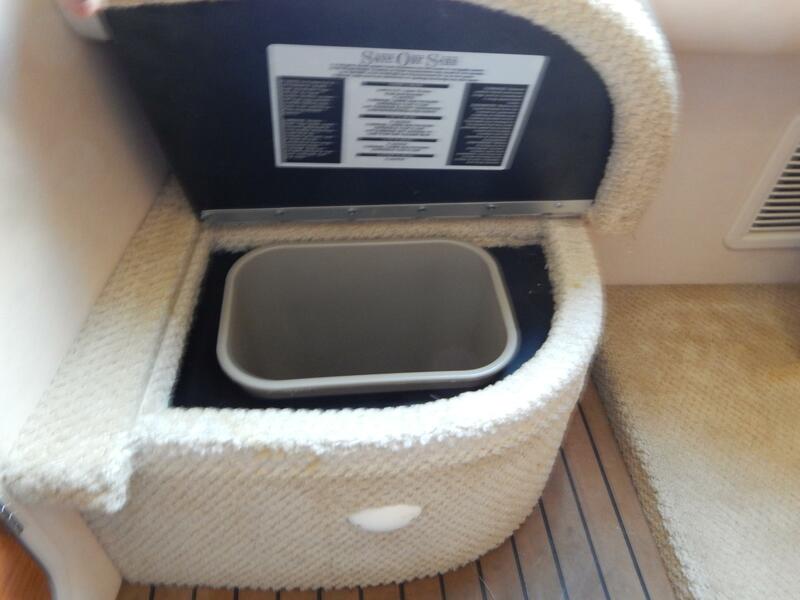 A LARGE IN FLOOR STORAGE BOX SITS BETWEEN THE HELM AND THE COMPANION LOUNGE. 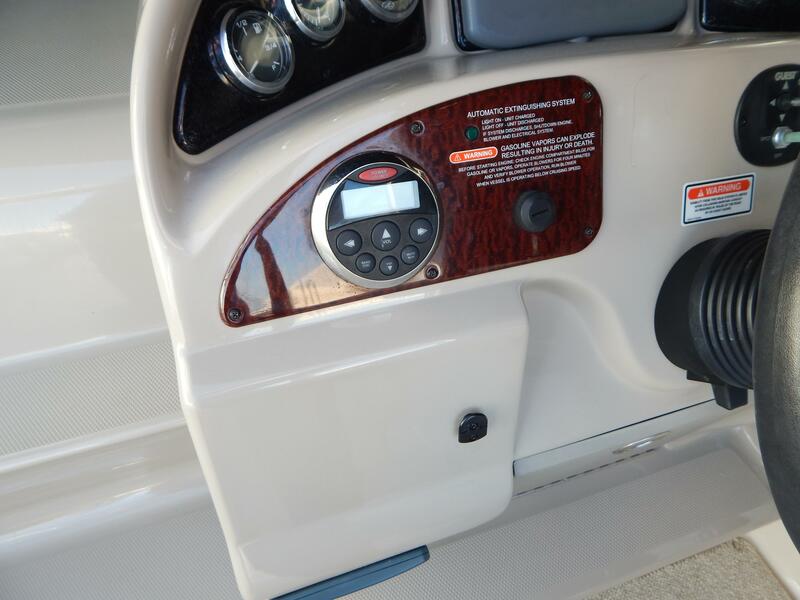 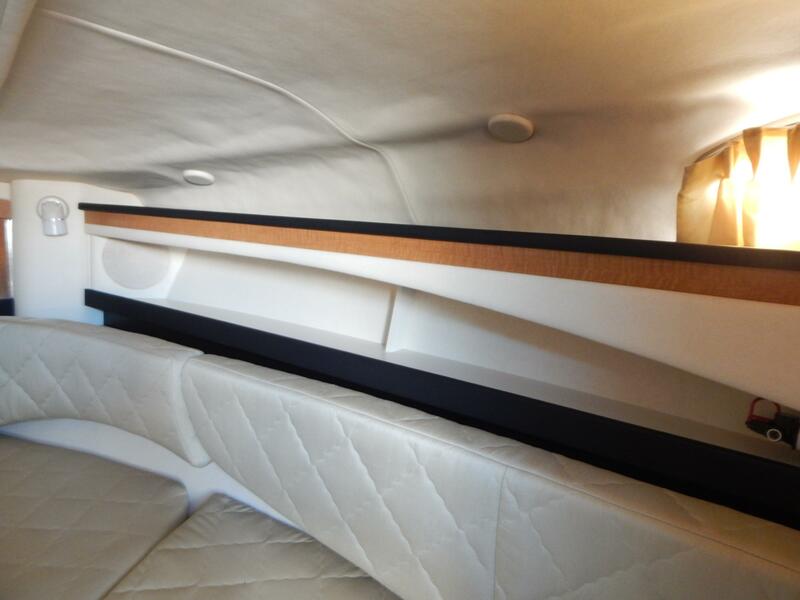 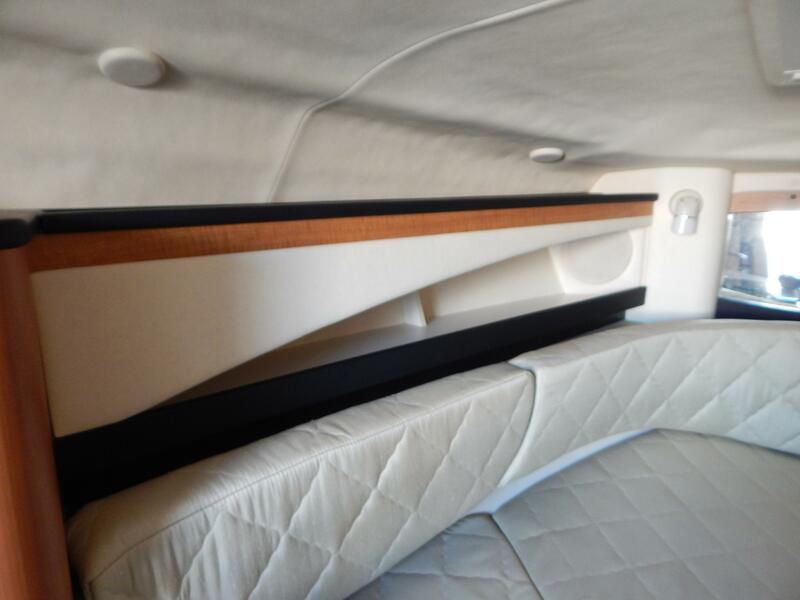 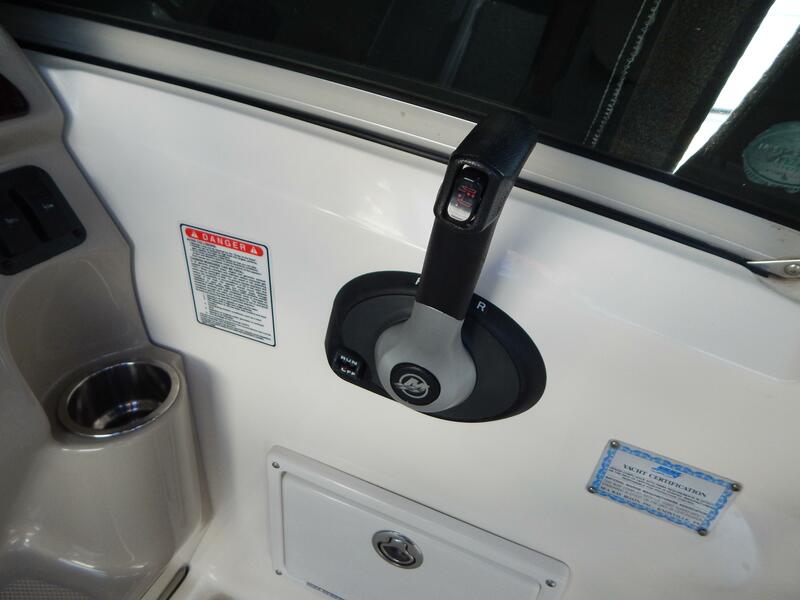 YOU ENTER THE CABIN THROUGH THE LARGE SLIDING DOOR THAT ALSO PROVIDES THE STEPS TO THE WALK THROUGH WINDSHIELD. 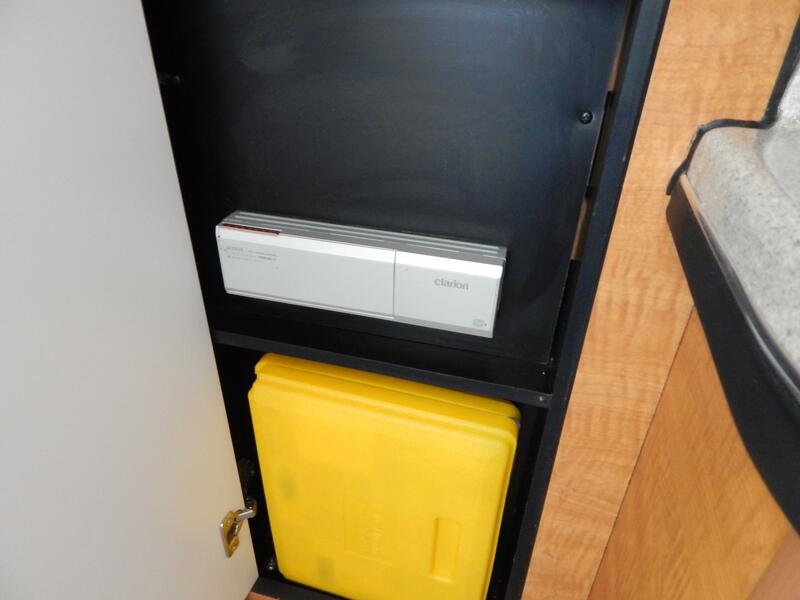 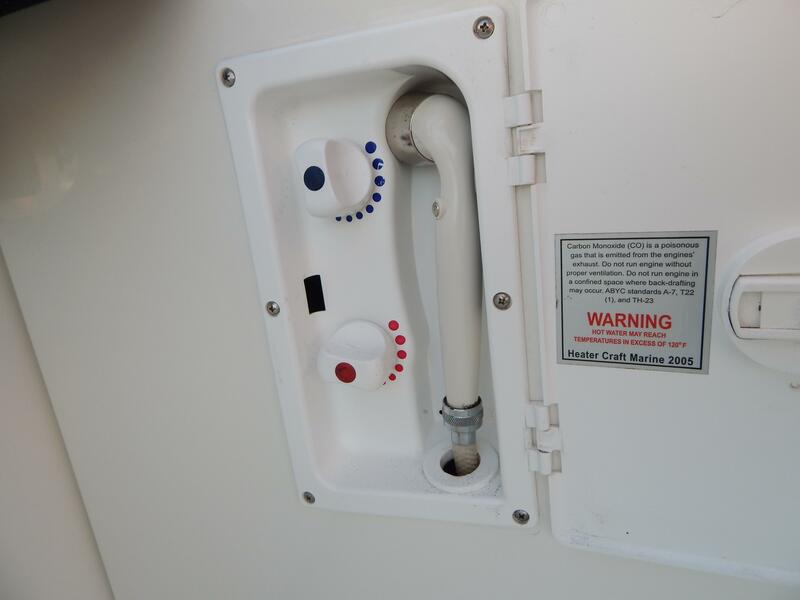 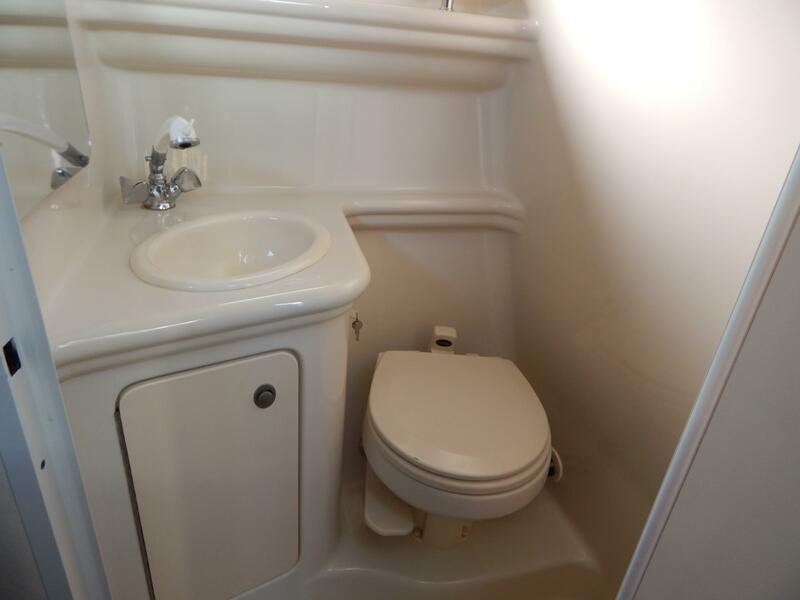 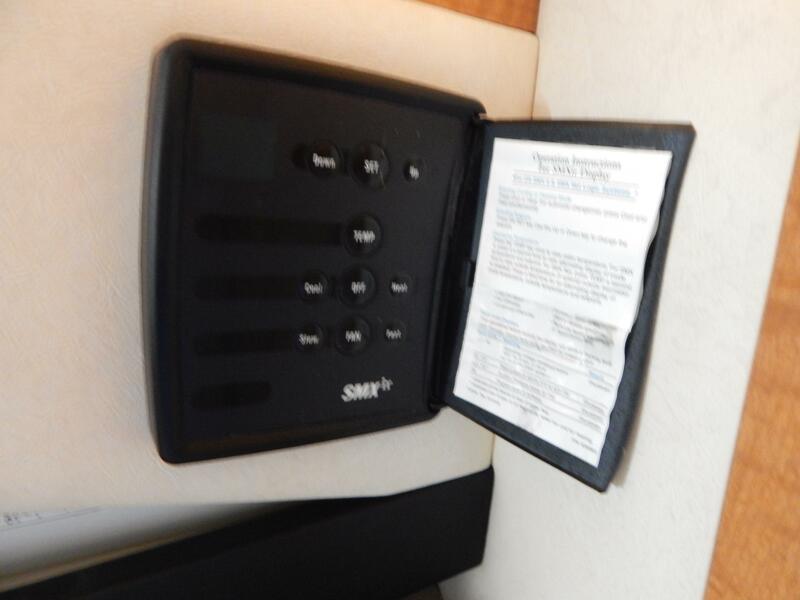 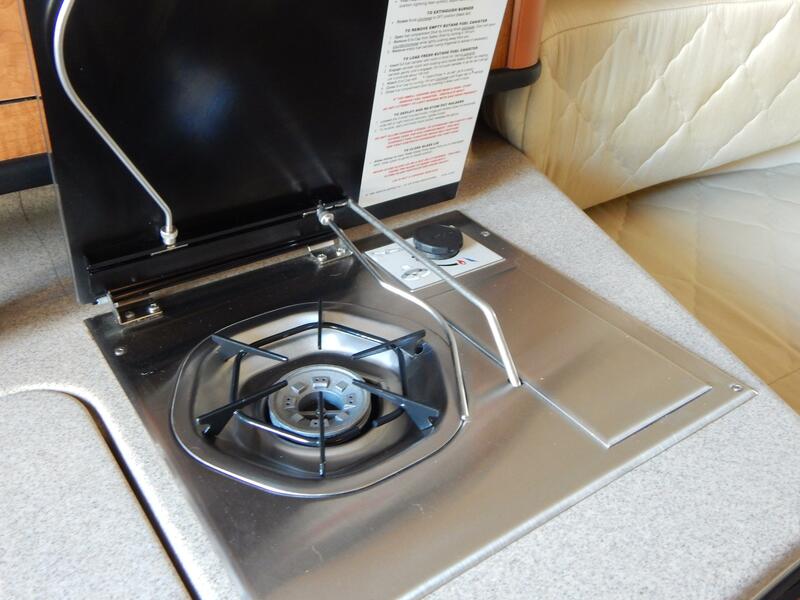 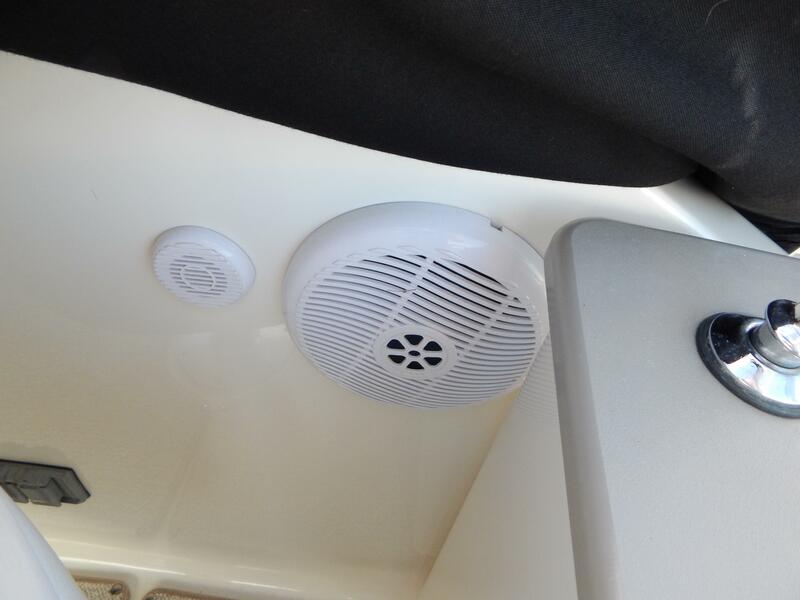 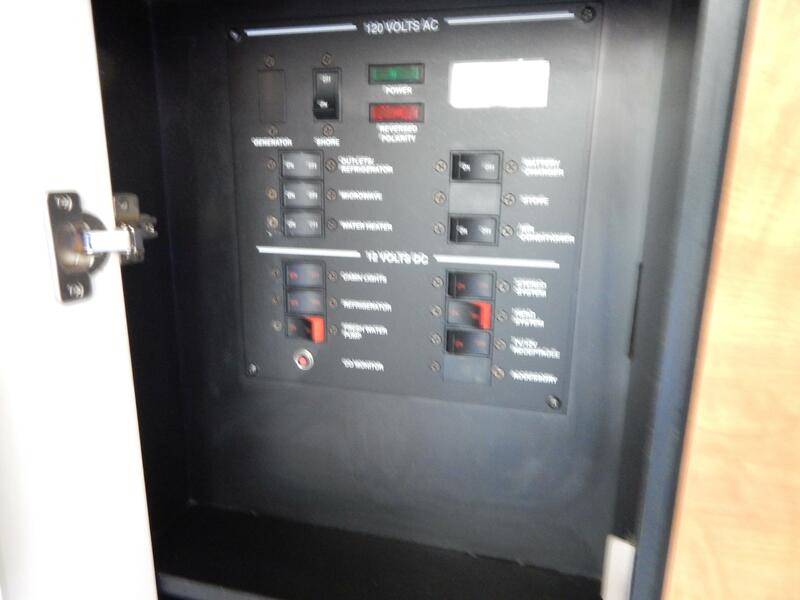 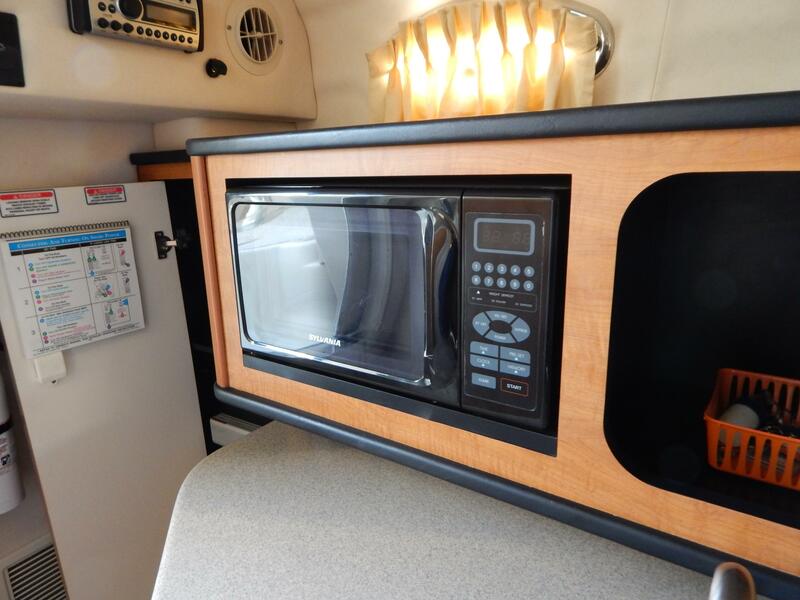 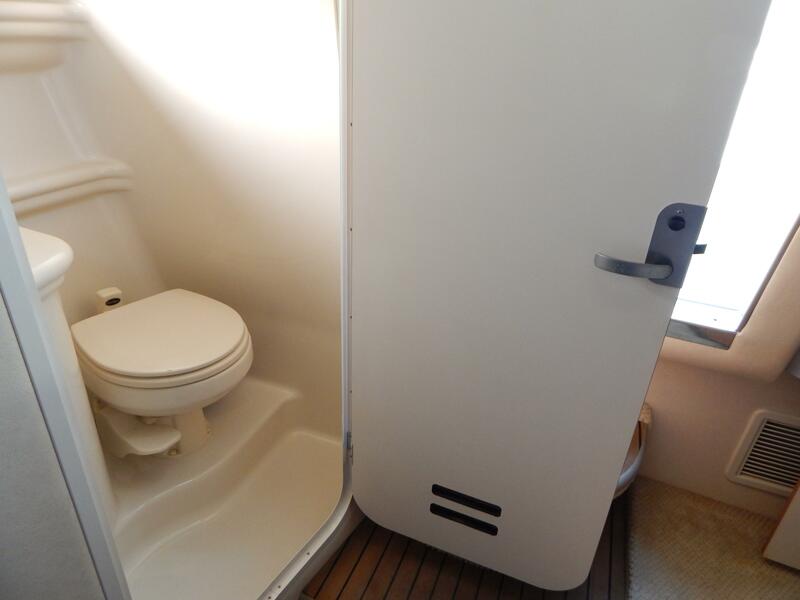 ONCE INSIDE THE WELL APPOINTED CABIN, THERE IS A SMALL GALLEY w/a SINK, COUNTER SPACE AND A DUAL VOLTAGE REFRIGERATOR. 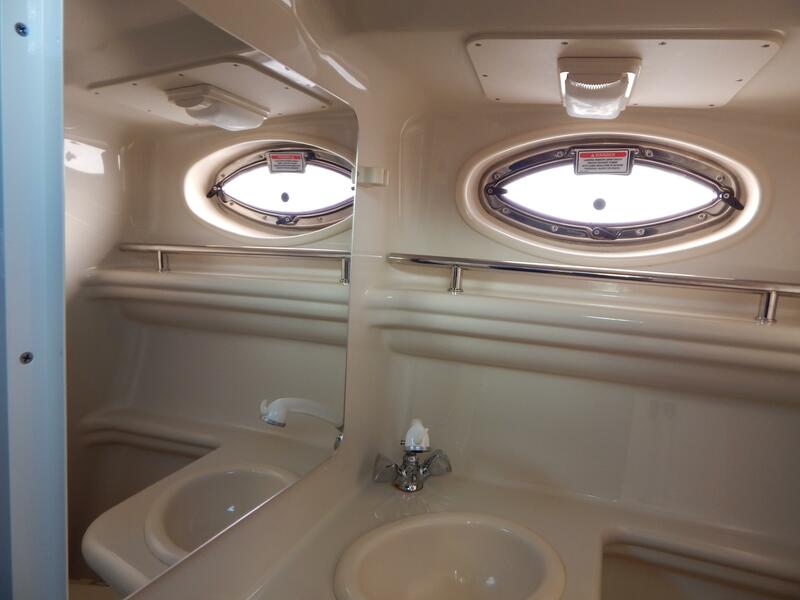 OPPOSITE THE GALLEY, IS THE HEAD WITH A SOLID DOOR, VANITY AND A MARINE HEAD. 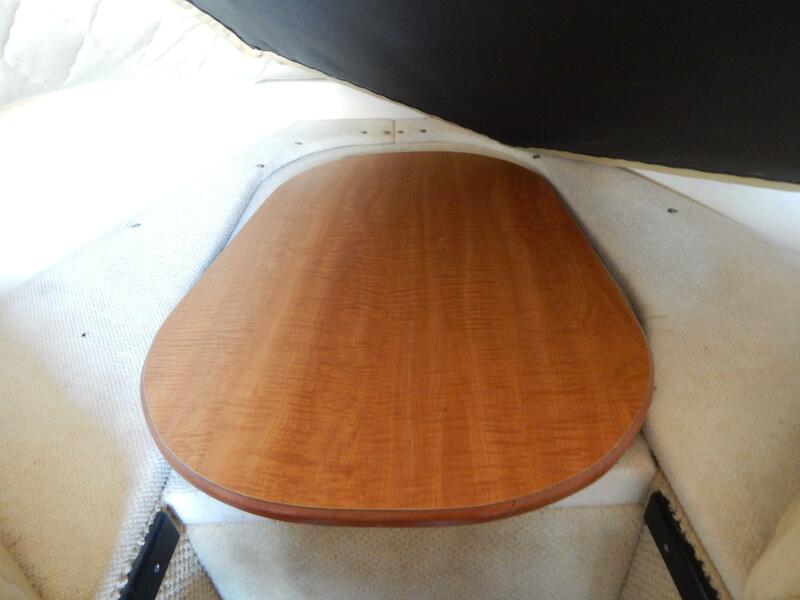 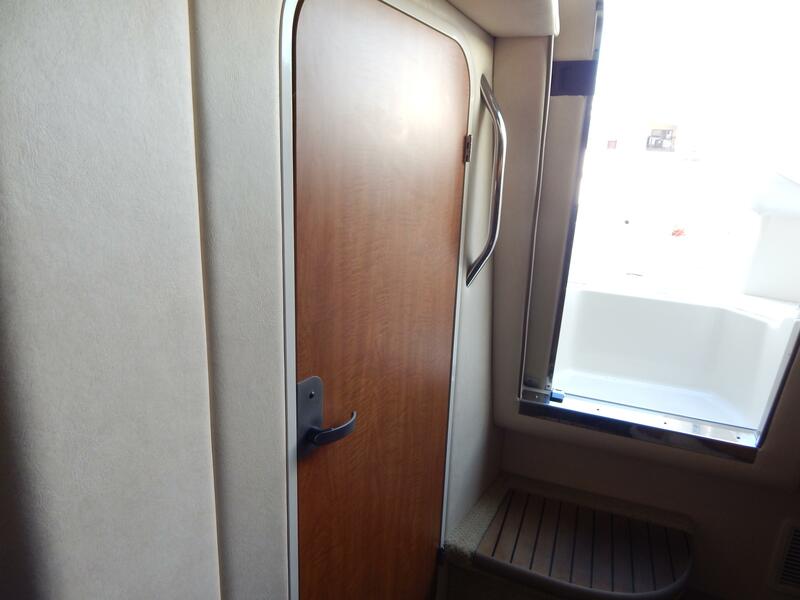 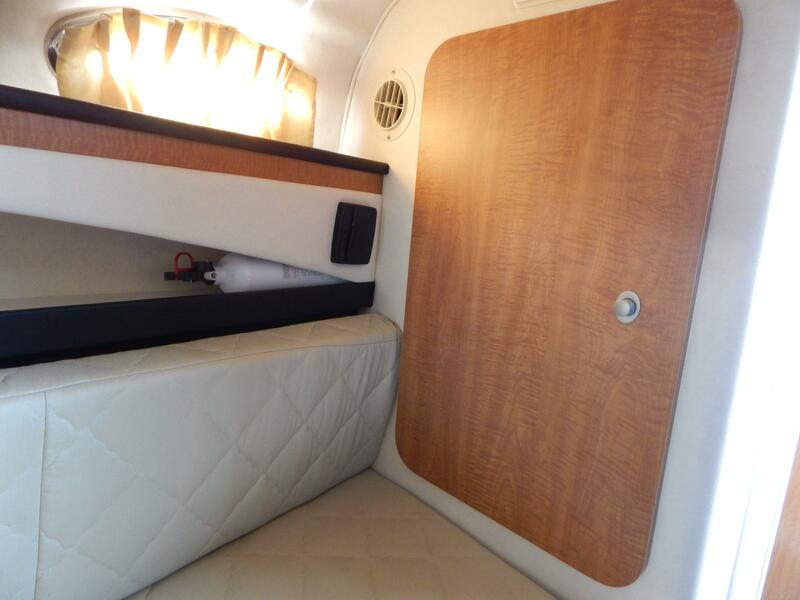 THE FORWARD OF THE CABIN IS SET UP TO BE A DINETTE OR A BERTH. 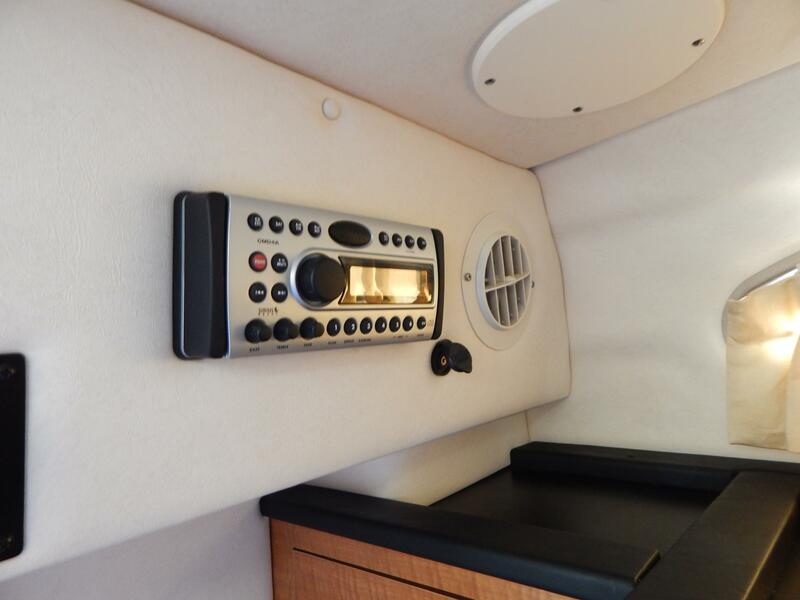 SOME OF HER EXTRAS INCLUDE THE FACTORY SPEC FISHING PACKAGE w/RAW WATER WASHDOWN, 7000btu AC SYSTEM, UNDERWATER LIGHTS, REMOTE SPOTLIGHT, CD STEREO w/CHANGER. 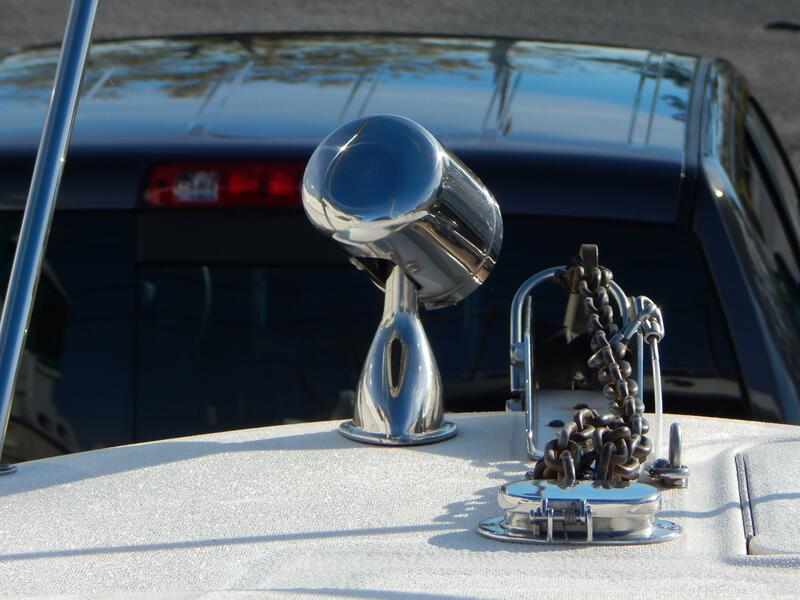 FOR MORE INFORMATION ON THIS FANTASTIC AMBERJACK!! 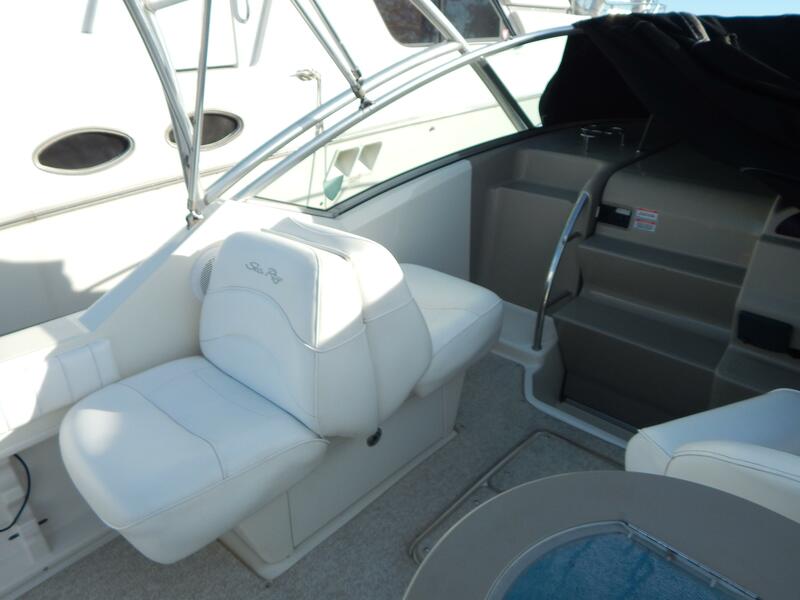 The Sea Ray 270 Amberjack offers the best of both worlds for sports-minded families-comfortable cruising plus an optional full-feature fishing package. 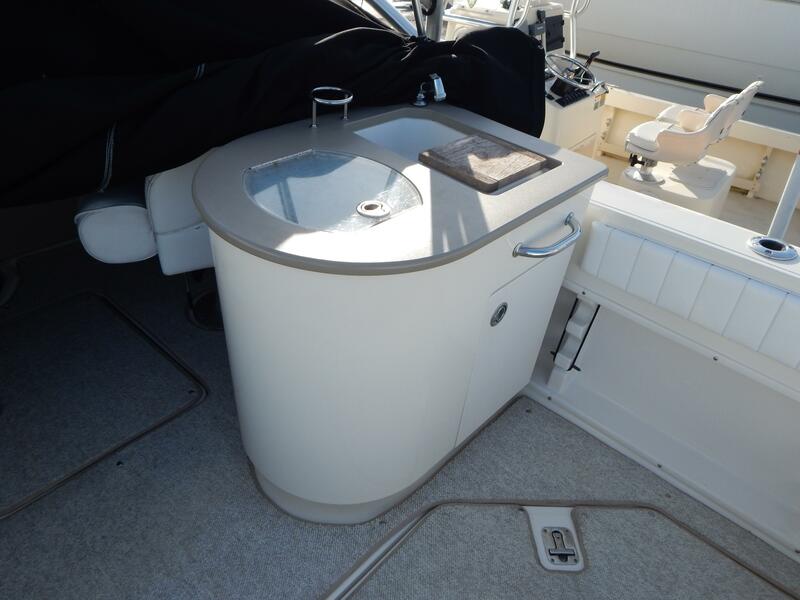 The stylish cockpit includes versatile seating and built-in storage, while the spacious cabin below features a convenient galley and dinette, elegant V-berth and full-size head with vanity and shower. 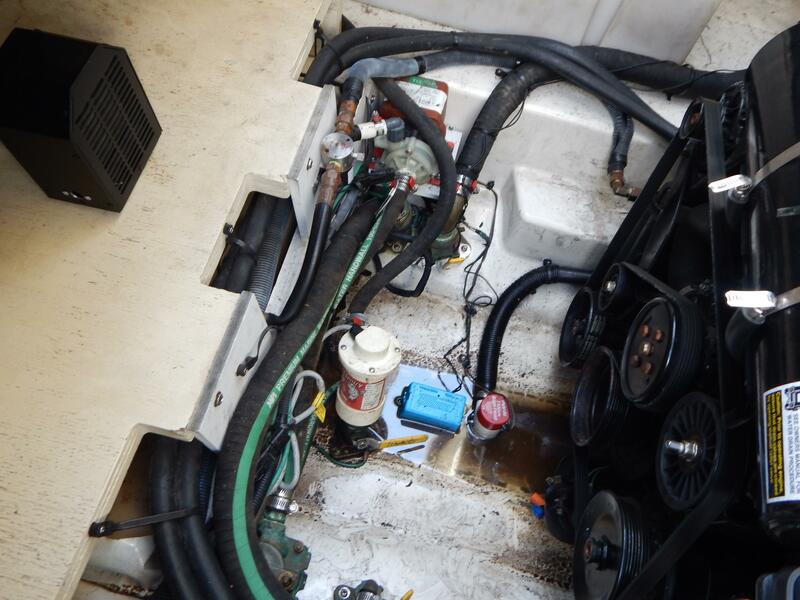 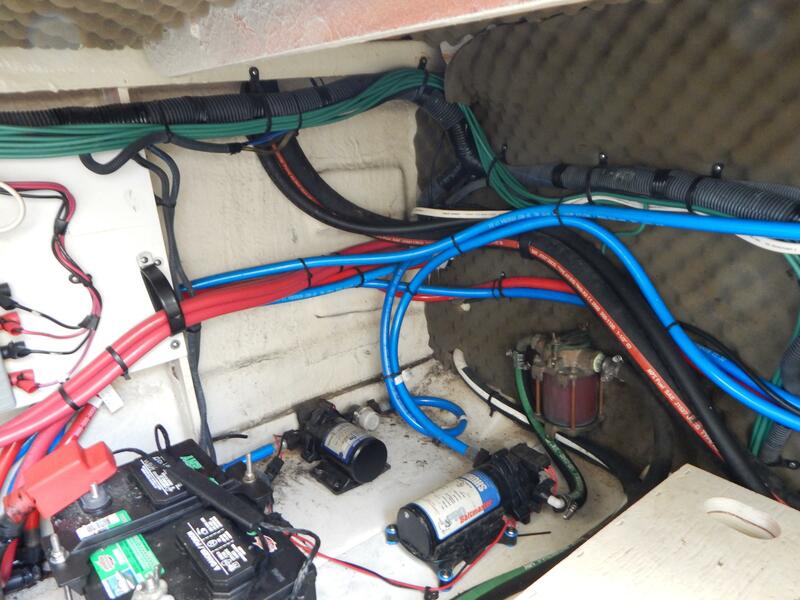 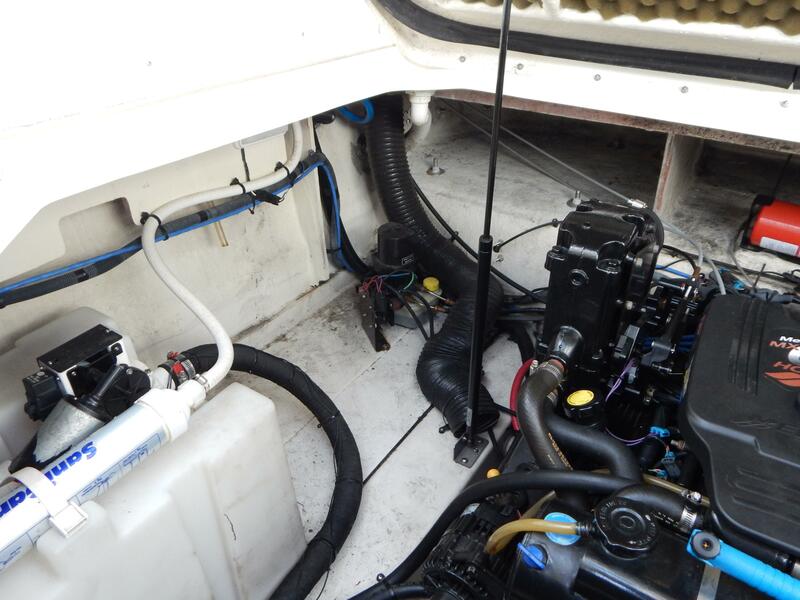 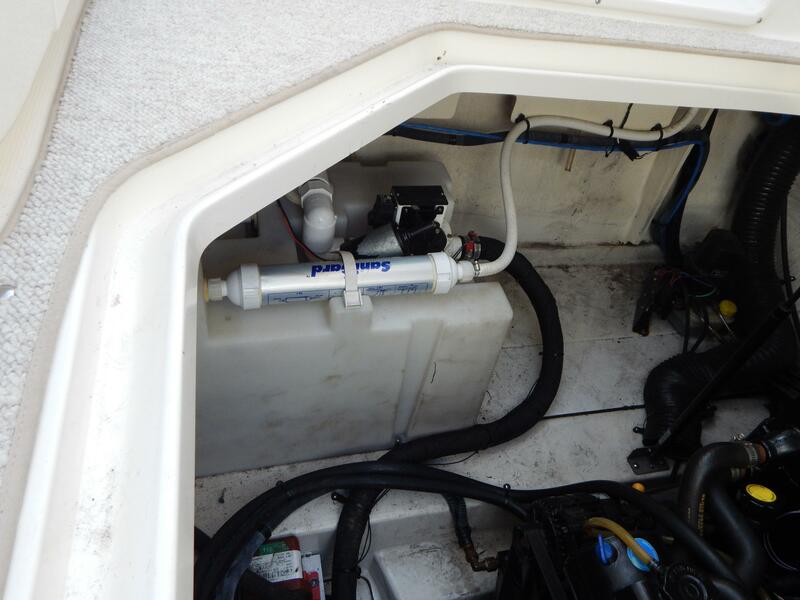 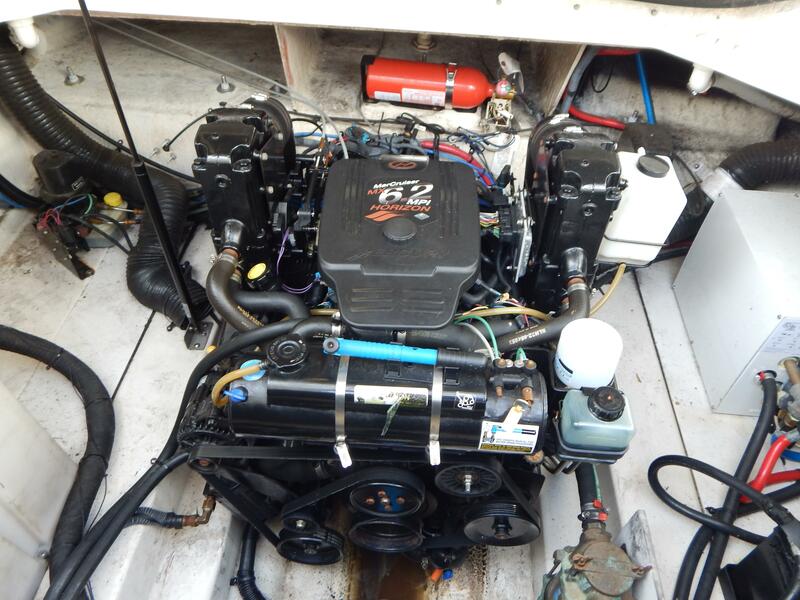 Fresh Water Cooled Mercruiser 6.2 w/ B-III Drive.